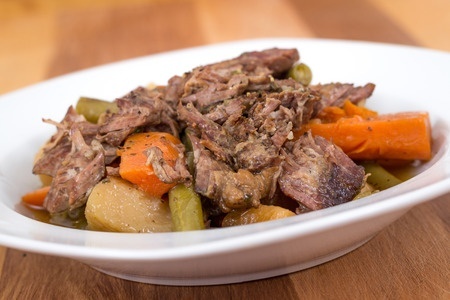 I've had a few requests for the recipe for my pot roast. It is delicious and I have no idea where I found it. It was scribbled on a slip of paper and tucked into my recipe file so I'm guessing it was on either a TV or radio show. Here it is, I hope you like it as much as we did. And thank you to whoever gave it to me. Preheat oven to 190 degrees Celsius. In a large, heavy, oven-proof casserole or Dutch Oven heat oil over medium-high heat. Sprinkle roast all over with salt and pepper. Place in pan and brown on all sides. This takes about about 10 minutes. Turn the meat fat side up. Add stock, wine, if using, onions, garlic, bay leaves and thyme. Stir in tomato paste. Bring to a simmer, cover; put in the oven, and roast for 3 hours. Add carrots and potatoes, and cook until vegetables are tender, about 1 hour more. Check regularly to make sure there is enough liquid to make the gravy. Add more boiling stock if necessary. Because of the long, slow, gentle cooking this recipe is perfect for tough cuts. If you are not sure which cut to use ask your butcher. Be sure to tell him that it cooks for at least four hours in the oven so he can advise you of the choicest piece of meat to use - they are usually the cheaper cuts, perfect for a tight grocery budget..
Next time I cook this recipe I will add more stock to make more gravy, it helps to stretch the meal. You may like to increase the stock to 3 cups if you like lots of gravy with your meat and potatoes. We would normally get two meals from a roast like this but it was so nice that the Fridge Fairies visited during the night and all that was left was the empty plate!